Budge Studios and Nickelodeon have announced a partnership to develop and publish interactive story book iPhone and iPad applications based on some of the Nick’s most popular shows, including Dora the Explorer and SpongeBob SquarePants. Dora the Explorer recently celebrated its landmark 10th anniversary and still ranks as one of the top preschool shows on TV. SpongeBob SquarePants has been the No. 1 animated program among kids ages 2 to 11 for more than seven consecutive years. The first of several iPhone and iPad apps to be released through the partnership is Dora’s Christmas Carol Adventure, which is based on the TV special. The app will feature a fun holiday-themed story, original songs, and interactive mini-games. It will also teach Spanish, colors, reading and the value of sharing. Both the iPhone and iPad versions of the app are scheduled to launch on December 1, 2010. Budge Studios also developed MegaBloks Playground, which I have tried out on my iTouch. Being an adult with no toddlers handy to give this game some hands-on experience, I found it very difficult to view this title as a toddler would. MegaBloks Playground is not a game, per se, as there are no points, timers or achievements. It is an app to amuse young children, a purpose for which I think it would be successful. MegaBloks Playground features a choice between two characters, a boy and a girl. 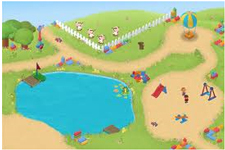 Your toddler can make their character move around the playground by swiping their finger across the screen, leaving footprints in the sand as their character walks from feature to the next. One drawback to the iTouch version of the game is that the entire playground is not readily visible, which I think detracts a bit from the experience. Obviously this would probably not be an issue with the iPad version (I don’t own an iPad, so I can’t confirm this for certain). The game’s objects are all cleanly drawn and brightly coloured, with the animations running smoothly, which would appeal to toddlers and keep their attention on the game. The music and sound effects which accompany the game are in no way jarring or irritating, which makes the music especially quite pleasant to listen to. The playground itself is populated with items one would expect to find in a real playground, which means the majority of toddlers would know that by tapping on the slide, swings and teeter-totter would allow their character to interact with them and listen to the unique sound effects assigned to each activity. Characters can also go for a short balloon ride across the playground. Scattered around the playground are small piles of blocks, which the characters use to build items like airplanes. One drawback, however, is that once the item is assembled, there is no way to interact with it, and it eventually disappears from the screen. I would like to see a few more activities built into the app, which would make it a little more educational, such as perhaps finding a way to build in shape recognition or colour-matching, along with a way for players to make their own creations to interact with. Overall, though, I think this is a well-designed app that will do what it’s intended t0 do – stimulate and amuse sensory perception in toddlers, and I would give it a rating of 4/5. This entry was posted on Saturday, November 13th, 2010 at 11:52 am and is filed under Business News, Casual, Early Childhood, Everyone, Game Reviews, Mobile, National News, Upcoming Releases. You can follow any responses to this entry through the RSS 2.0 feed. You can leave a response, or trackback from your own site.